The great white shark swims in a cesspool of negative stigma. This is due mainly to its enormous size and many rows of razor-sharp teeth, not to mention the fact that the human beast has a tendency to fear anything that may pose even the smallest threat to its Earthly dominance. Sharks do kill – around 10 humans per year – but when they do it is usually a case of mistaken identity, while humans are known to kill around 20 to 30 million sharks annually. Given the facts, it is clear to see who the true monsters are. In 1975, Steven Spielberg would use his technical mastery to play on our inherent and largely misguided fears, orchestrating the tempo of our pulse rates the way John Williams did his wryly menacing score. It was those two facets, more than anything else, that served to bolster the shark’s misrepresentation. Jaws was inspired by the true-life Jersey Shore attacks of 1916, and although Spielberg would bend the facts about sharks to his commercial whims, with 1987‘s Jaws: The Revenge, the brass at Universal Pictures would disfigure them beyond all reason. Mr Spielberg gets the most important call of his life just a moment too late. It is one thing to portray a shark as a vicious killer beset on a singular rampage. Every species is capable of betraying the laws of its nature, and sometimes hunger can get the better of anyone. But to suggest that an ancestor of the original shark could stalk the relatives of its prey more than a decade later is bordering on the heretical, and it becomes rather difficult to willingly suspend one’s disbelief. It is perhaps an indictment of the human race as a whole that shark deaths doubled in the year ending 1987― just kidding, but if you’re the kind of person who would allow themselves to believe in Jaws: The Revenge, you’re the kind who would probably believe anything. Following his father’s death from an off-screen heart attack – which wife Helen (Garry) attributes to his fear of sharks (please!) – youngest son, Sean Brody, has taken the mantle of Deputy of the infamous Amity Island, and spends much of his uneventful existence investigating cases of cow-tipping. That is until he is called out to dislodge an old dock pile drifting in the channel, only to be savaged and killed by a waiting Jaws in a furtive attack 007 would have been proud of. Van Peebles would offer hugs to distressed cast members. It only stands to reason then that the original shark’s buddy has been planning the attack for years, patiently musing the finer details with a sharp-toothed grin of ice-cold vengeance. That’s what Brody matriarch Helen believes as she tosses and turns during shark-related nightmares, and when eldest son Mike (Guest) arrives to take her to the Bahamas, she badgers him to quit his job as a marine biologist, a career path she surely could have dissuaded him from pursuing in the first place. Incredibly, not only is Helen right about the fact that the shark’s attack on her dead son was premeditated, crazy delusions about her family being the target of this unscrupulous mastermind turn out to be anything but. Not content with merely running the Brody family out of town, Jaws follows his victims across the Atlantic and patiently awaits his opportunity, appearing with the contrivance of a Days of Our Lives character at any given moment. This is a quite remarkable feat for a creature who hunts from the surface down. I mean, sharks are an astonishing triumph of nature, able to sense blood from up to 5km away, with a field of vision of about 15 metres, but to suggest one could tail air-bound prey for 1000 miles is beyond the boundaries of plausibility by approximately the same distance. Perhaps this lunacy might have been forgiven if the movie was any good. I mean, it is technically proficient, with the kind of budget and location that lends it a big movie feel, but it is so painfully pedestrian. If we’re not following our wimpish male lead on laborious excursions we’re staring at blank, unfettered landscapes or listening to the hackneyed patois of plastic Rasta Jake (Van Peebles). Even the legendary Michael Caine is unable to rescue this one, his oft-endearing chatter stretching interminably without ever taking the plot anywhere. Never have I lusted for a little bit of tired exposition, if only to hold my attention. Even with the mastery of Spielberg as a blueprint, director Sargent seems incapable of building even a modicum of tension as the shark pursues its targets at every turn. Done well, a little tension can distract a viewer from any old garbage, but the only jump the movie inspires features some kind of snapping eel, and when you find yourself scared more of an arm-sized worm than an exaggerated Great White, you know there is something fundamentally wrong. Quizzed on his participation in the movie, Caine would reply, “I have never seen it, but by all accounts it is terrible. However, I have seen the house that it built, and it is terrific.” A cute response, but one tinged with a pang of displeasure. So, how much are they paying you for this one, darling? 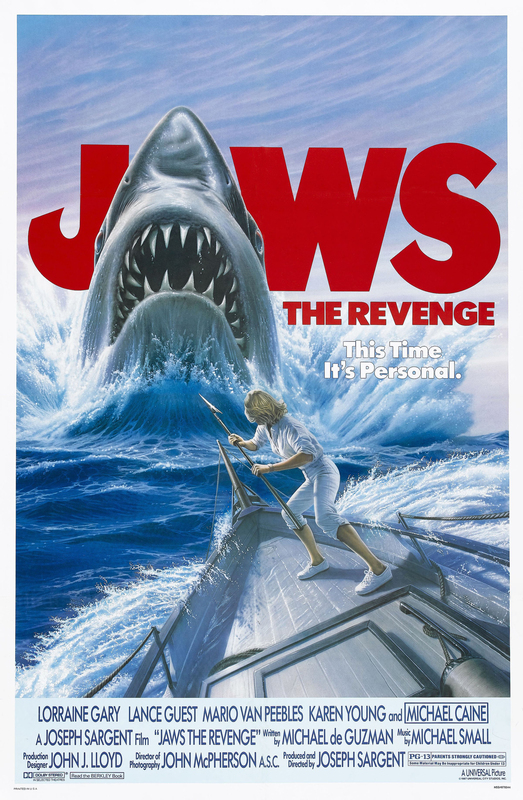 So what is it about Jaws: The Revenge that has burdened it with such a bad reputation? Sargent is a more than competent director, which leads to me believe that the main problem here ― other than the improbable plotting ― are the weaknesses in characterisation. Every character deserves to die in this movie: a marine biologist who plays to the sharks strengths; a grieving mother who allows her five-year-old grandchild to ride a banana boat a week after losing her youngest son; a womanising gambler who purposely crash lands a plane into the ocean, putting himself and his two passengers at the mercy of a murderous shark. I mean, come on! Of course, once you lose patience with the characters, you lose sympathy for them, and once you lose sympathy you stop caring. As a result tension is quite impossible, and you find yourself rooting for the big rubber dud as the movie draws to an unambitious end that really can’t come quick enough. 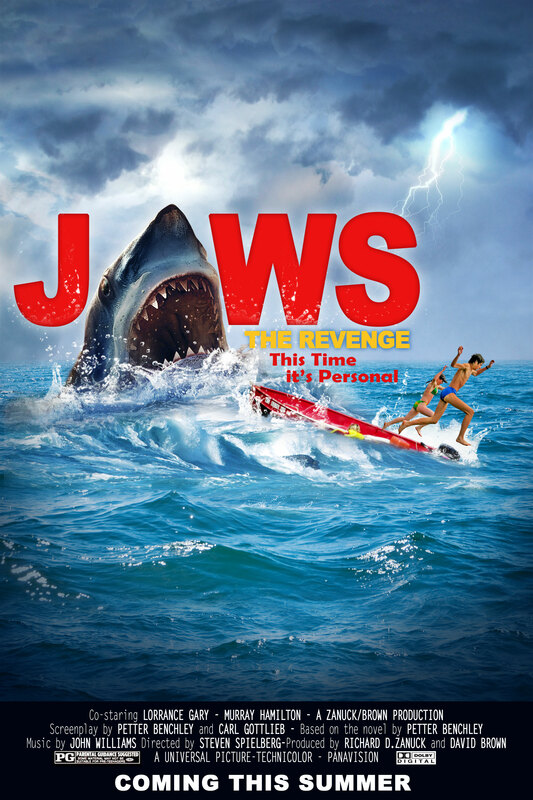 It comes as no surprise that Jaws: The Revenge was enough to bury the franchise for good. Drawing his prey with a carefully positioned decoy, head of Mensa International’s Underwater Division, Jaws, rips off Brody Jr’s arm before turning him into a deluge of foaming crimson. Totally unaware of a sharks attraction to erratic movements, marine biologist Michael frantically flees the beast in a fit of flapping, and as a result almost subjects his five-year-old daughter to her second family death of the week. After a senseless Helen commandeers a boat and goes in search of the killer shark, love interest, Hoagie (Caine), swoops upon the scene in his plane and quickly radios for help. I’m sure he’ll have no problems there! 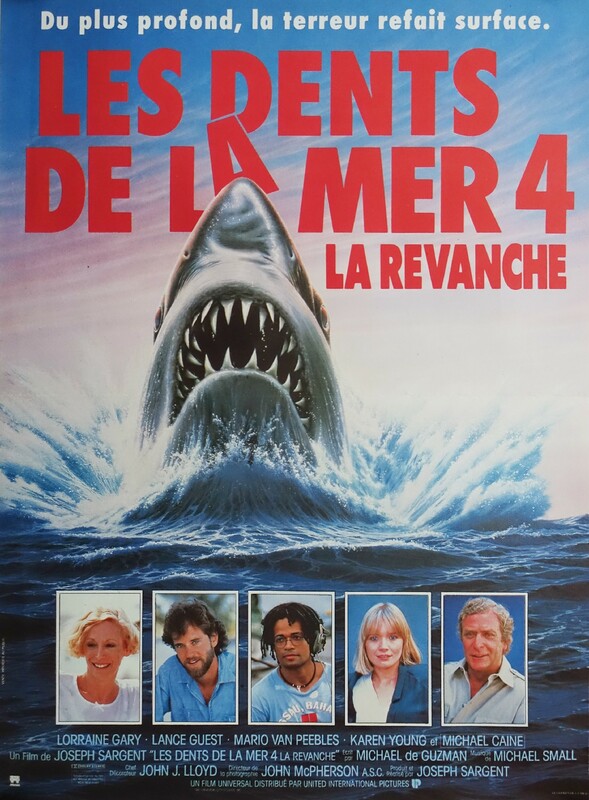 For a movie about the ‘King of the Seas’ Jaws: The Revenge is a lame duck. With a total absence of terror, you find that your yawns grow fiercer than the rubber-toothed imbecile, a supposed predator who fails to kill a cast of characters who give him every opportunity. But even with a plot as laughable as this one, the movie proves to be agonisingly dull, with no redeeming qualities accidental or otherwise. What you end up with, horror lovers, is a decidedly toothless affair.